Sousaphones were designed as ~concert~ instruments. I honestly don't think I've seen actual 'concert tubas' used in marching situations. Besides sousaphones, contras and convertible tubas, there was ONE band I saw using Cerveny BBb helicons for marching band many years ago during H.S. competitions. It was actually kinda cool seeing a band using those "weird" rotary helicons, while everyone else was using sousas and contras. No, I saw that, but specifically asked about "tubas" not sousaphones, contrabass bugles (or marching tubas), or helicons. You could consider applying to become an administrator, posting all of the posts in a thread yourself, and then locking that thread. That way, all of the posts in that thread would meet with your specific approval. When I was in school, I'm not sure that we really used the word, "sousaphone" that much. ...so we - just as J.P. Sousa - viewed the fiberglass sousaphones as "concert tubas" and (again) did quite well with them...and yeah, we took them outdoors. What else would we have taken out there? bloke wrote: You could consider applying to become an administrator, posting all of the posts in a thread yourself, and then locking that thread. So I take it that’s a “no” from you regarding concert tubas used in marching settings? Although.... in my opinion....... concert tubas offer a nice warm bottom to a marching band, off the top of my head, I can think of at least three issues with using tubas instead of sousaphones. 1. Tubas are somewhat cumbersome to handle on the move...... especially if you are in a show-style marching band..... quick turns in opposite directions, high step, sudden stops, etc. In corps, and in a straight ahead parade band, it's a totally different ballgame. 2. In marching bands, I like the more pronounced (for lack of a better description) brighter and intense sound. While some huge bands have been designed to offer a concert band sound on a football field, I prefer to have my attention (and ears) commanded by the sound of an impressive "outdoor" sounding band.... Example..... Ohio State. 3. I regard concert tubas as prized instruments. Therefore, I'd be knocked to my knees to see the damage that occurs to marching band sousaphones, happen to my concert tubas!! You can add the Italian bersaglieri military bands. Top valves. The music isn't very complex, and they don't really march - they sprint. But they do it in synch and in formation, so I think it counts. Other Italian marching bands also use top valve tubas. Portuguese bands use whatever they can get their hands on, top or front valves - and the tubas march in front. ...just as you could have ignored any responses that were of no interest to you, rather than commenting on them. rather than than resting them on a left shoulder MUSCLE (which is typically sore for three or four days, and then becomes strong). One of my High School section mates called it "da juice bone"
I assume/suspect that your friend is clever. I will speak to various schools' levels of academic prowess, however. My niece (who did not live in our neighborhood) applied to transfer to our neighborhood's middle/high school, due to known higher academic standards. Based on her previous grades, she was allowed to transfer. However, her grades faltered at our neighborhood school, and she was sent back to her own district's middle/high school. She ended up being the valedictorian of her own neighborhood's high school. beats me . . . it's just what he called that group of muscles and tendons. Three of the top 10 students in that class were tubaists, now that I'm thinking about it. I've marched with my B&H Imperial a couple of times without straps or support. Not impossible on a short gig, but I really prefer a sousaphone. I've never played an actual marching tuba or a convertible. Do they have a specially shaped outer pipe, or how does one hold a marching tuba still? I tried holding a concert tuba on my shoulder and it felt very impractical and unstable. Lars Trawen wrote: In Europe a majority of marching bands use concert tubas. In Germany also Kaiser tubas. Myself I've never used anything else. Other used basses are helicons and sousaphones but these are not common. I also have a feeling that Central European bands quite often use concert tubas. Helicons are sometimes seen. Is sousaphone too American for them? You sort of neglected the fact that the sousaphones that were designed as ~concert~ instruments pretty quickly morphed into more bell forward (marching) than the helicon from which they sprang. I'm not sure that any of us has the whole story. My understanding of the early 20th Century view of curved-bell tuba-family instruments (when wax and shellac acoustic/pre-electronic recordings first were marketed) was that the tuba sound made it into the acoustic recording "horn" more effectively...and thus were referred to as "recording" bells...but most of the other brass instruments ~already~ had forward-facing "recording" bells, yes? 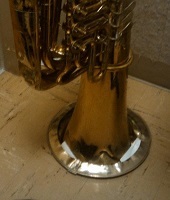 ...and there are curved-forward bell instruments that were built before "sousaphones" (which - distinguished from a run-of-the-mill helicon - feature at least one 90-degree elbow before the 1st branch...and - most of all them, eventually - two elbows for a forward-facing bell) were ever fashioned from run-of-the-mill helicons. - Sousa considered sousaphones to be "concert" instruments...and (having seen many-many vintage pictures of hotel bands, jazz bands, and other professional non-marching bands) it's pretty obvious to me that quite a few others considered sousaphones to be "concert" instruments as well. - My high school band considered it's (fiberglass, btw) "sousaphones" to be "concert" instruments, because that's all we had...and when other schools from other schools showed up to compete with us one-on-one with their more expensive (labeled by most all as) "concert" instruments, they were never very happy to see us show up, because they knew that they would not be awarded any of the top chairs in the blah-blah-whatever band. A friend of mine who is intensely familiar with the history of the U.S. Marine Band told me years and years ago that Sousa had the Sousaphone in its original form (bell pointing up) built because he felt that the helicons were too loud. Maybe you need to take this bit of information with a grain of salt, though. As for marching with concert tubas: there are a few events such as the Oktoberfest parade in Munich for which wearing traditional garb is very important. Sousaphones, front-bell tubas and the like would probably be considered to be out of line with that dress code, and I guess for many musicians it's like wearing your sunday best to have a nice, shiny instrument. in the past, I would laugh at how topics would change and – even though my posting is about 20 times as often as it should be – I would try to stay on topic. The thing is that others - who only posted about as often as one probably should - would not stay on topic. A short while back – when Farah took over the site – I commented on that, and she made it very clear that is perfectly fine to change topics in midstream. ...so – along with my over posting – I joined in the stream of consciousness thing here…and sousaphones (again) are "concert" instruments, and also are tubas. Seriously, I remember a person who used to try to bend all the topics around to - specifically - jumbo sousaphones. Does anyone else remember that person? Looks to me like Russian and Serbian military bands may march with "concert" tubas, though in some cases I see sousaphones in the Russian bands. Back in the early '80s I was a tuba player with the 298th US Army Band in Berlin, Germany. Berlin, being mostly Protestant, doesn't have a tradition of Fasching (the German version of Mardi Gras) so we were invited by the 11th Cavalry in Fulda (whose band had deactivated some years before I entered the service) to do some ceremonies for them and play for their Fasching parade. The first year we went, we took our white fiberglass sousaphones (it's what we had then) and the commanding officer of the 11th Cav said it looked like we were playing toilets. So the next year we took our upright tubas (Miraphone, Alexander, Meinl-Weston, and Conn). The C.O. 's comment about our new appearance: "Sure looks better without the tubas!" konna4 wrote: I've marched with my B&H Imperial a couple of times without straps or support. Not impossible on a short gig, but I really prefer a sousaphone. I wouldn't want to carry a regular concert tuba in front of me for very long, even with a strap. Same as marching percussion -- all the weight out in front is a real stressor on my back. Marching tubas/contras are designed differently, yes, with hand placement and overall balance being very different from concert tubas held horizontally. Convertible models come in two basic flavors: upright-piston tubas that only need a different leadpipe swapped in (such as Yamaha YBB-201M), and front-action tubas where the entire valve section flips around (I think Kanstul still makes them). Non-convertible models have their valve section and leadpipe arranged for easy reach and decent front-to-back weight balance. 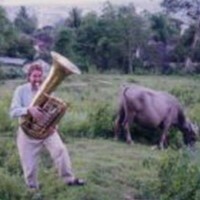 Leland wrote: I wouldn't want to carry a regular concert tuba in front of me for very long, even with a strap. Same as marching percussion -- all the weight out in front is a real stressor on my back. Yes - thinking about the countries where I noticed they do that, it occurs to me that they also have stronger accordion playing traditions, so it's possible that many individuals in these areas develop more robust backs. (A fairly typical accordion, with several reed sets, might weigh 20 to 25 lbs.) Perhaps tuba players there are drawn from the ranks of these sturdy individuals.